Palm Beach Post – Two brothers from Baltimore moved to Miami after World War II to launch a clothing business called Baron’s Men’s Furnishings in Miami Beach. Their sons, Steven Shapiro and Ron Pertnoy, worked for their fathers and conceived and managed a hippie clothing division called The Other Half in the 1970s. Think: bell-bottom blue jeans for $6.50. 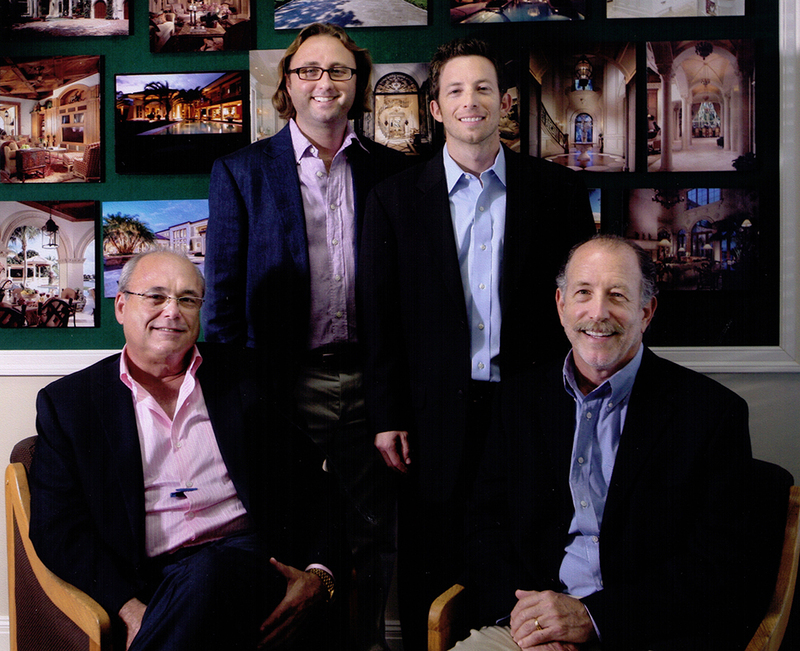 Shapiro and Pertnoy pursued other interests, but in the 1980s, the cousins formed their own Palm Beach County company that builds custom homes. Today, Shapiro/Pertnoy Companies has evolved to include commercial property management and luxury real estate development. Now, Shapiro’s son Kevin and Pertnoy’s son Josh are following the same path – learning from and working with their fathers. That translates to more than 60 years of family business knowledge, passing from one generation to another. About your company: We are based in West Palm Beach with 17 employees. We have a lot of companies that do a lot of different things. There are two main areas: luxury and commercial construction, and leasing and management of commercial properties. We were the first single-family builder in the Polo Club in Wellington. As time went forward, we started building in other parts of the county – from Boca Raton to Jupiter. In 1981, we started building commercially in Wellington. We have 80-some homes in Admirals Cove in Jupiter. How your business has changed: We’ve gone through multiple phases. The phase of early growth and grasping what our industry is about. At the time, Palm Beach County was one of the fastest-growing counties in the country. We were lucky enough to be a part of this success. We saw that period of glory followed by a very severe downturn in the industry. Because we were reasonably diversified, we made it through those recessionary times by relying on things that were still working when everything else wasn’t. We had tremendous success though the ’90s at a time when too much success can also be detrimental. I always use the example: One can build 10 houses well, and the 11th house may be just too much. And that puts all 11 of them at risk of not being done well. We learned about what our capacity was. We got smaller. That phase, the phase of learning what our capacity was to keep people happy – our customers and our tenants – we never went outside of the lines. We only want to do what we can do well. Advice from your fathers: It’s about the relationship that you establish with the customer that you are going to have for a very long time. We count many of our customers as our closest friends. What you tell young people about your business: The construction and development business is perceived as its own little microcosm. There are so many facets of both. There are lots of opportunities. Whether they are in real estate brokerage or management or the facets of construction alone. When people say, “I’m interested in real estate,” you have to drill down. A great way to learn the business is through sales or leasing to find out what the customers really want. Then you find out how to give it to them. What do you see ahead for Palm Beach County? Palm Beach County is always going to be a growing and building county. As long as it gets cold up north, people are going to come to South Florida. It’s difficult for people to move from Boston or New York or Chicago or Cleveland to Miami unless they have a reason to be there. Palm Beach County is still not overly trafficked. If you go farther north, you get a little culturally deprived. Power lunch spot: Somewhere I can get sushi. What is the most important trait you look for when hiring? The ability to get the big picture. We look for smart people who get it. I’d rather have a person who is an A-minus at what they do and gets the big picture and is a team player.